For eight years I was the copywriter at Air Canada Vacations and created results-driven copy and ad concepts for national campaigns. These ads are stories of the briefest kind, working to connect the viewer to a dream of travel and making it as real and obtainable as possible. How much can I inspire you in the few moments you engage with the work? All of the items on this page are the standout pieces of larger campaigns that included online, email, print and out-of-home. One of the first ads I ever created for Air Canada Vacations, this ad for travel insurance ran in the annual Sun Brochure with a circulation of one million. Copy read: On vacation, most surprises are good. Let us take care of the ones that aren’t. An ad promoting Air Canada Vacations’ newest incentive: FREE vacations for kids. This proved to be a popular motivator, making it more affordable for parents to take their families on vacation. 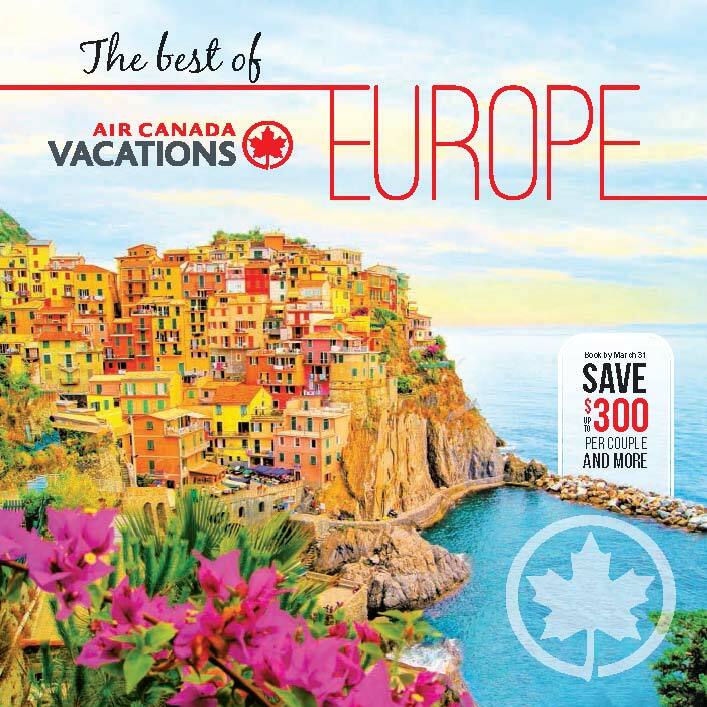 A multi-page mailer sent out to 60,000 past customers and key demographics announcing Air Canada Vacations’ expanded Europe offering. Bright and colourful with bite-sized content, this vehicle successfully increased traffic and conversion. Part of a national campaign promoting family summer travel, this web box linked through to a landing page with discounted packages to Mexico and the Caribbean. This concept leverages a parent’s desire to fill their child’s summer with memories and joy. The opening spread of the 2010 Air Canada Vacations cruise brochure was designed to highlight a specific moment, reframing cruising away from the endless onboard amenities into something deeply human and personal. This introduction raised quite a few eyebrows. We’d shopped the markets in St. Thomas. We’d climbed to Brimstone Hill Fortress in St. Kitts. We’d tasted delicious treats in Grenada. My parents’ anniversary has been toasted. My sister and her husband had fallen in love again. The kids, all six of them, had made new friends. And now, on our way to dive the blue waters of Bonaire, I stepped lightly to the bow of our cruise ship. This was going to be our evening together, our quiet moment to ourselves. We would watch the sunset in each other’s arms. Then enjoy a nice martini at the bar before a warm evening of rich seafood and dancing. Later, perhaps, we would toast the moon from our balcony and watch it shimmer across the waves. Maybe. And there he was, my one true love, my husband, waiting for me as he had promised. He stood on the deserted deck, the waves beating gently against the hull, the wind blowing in his hair. Cruising seems to have more passion, more sensuality than other vacations. Perhaps it’s the taste of the salt wind, of the exotic destinations, or perhaps it’s the exquisite feeling of being alone together surrounded by the vast romance of the deep, deep ocean. My dress caught lightly in the breeze. “Glad you could make it,” he said. The sunset blazed across the water.